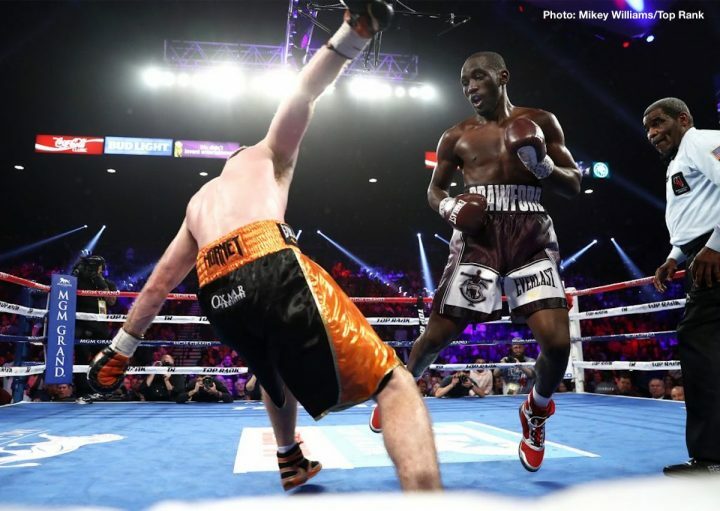 By Chris Williams: Terence Crawford has been named the 2018 ESPY Best Fighter for his wins over WBO welterweight champion Jeff Horn, Julius Indongo and Felix Diaz. It’s a nice accomplishment for the 30-year-old Crawford to get the ESPY award, but his biggest win was over Horn, a fighter that won a controversial 12 round decision over Manny Pacquiao last year. Horn was seen as an undeserving world champion. Crawford’s win over Horn is less impressive when you factor in the Australian’s questionable win over Pacquiao last year. It’s obviously a subjective thing in Crawford winning the ESPY aware instead of Errol Spence Jr., who is arguably a better fighter than him. Spence has a far better win on his resume from last year in defeating Kell Brook than Crawford does with his three wins. Further, Vasyl Lomachenko did more than Crawford to earn the award, and yet he didn’t it either. Crawford didn’t fight Regis Prograis, the fighter that is considered by many boxing fans as the best fighter at 140. Crawford being named the ESPY 2018 Best Fighter winning is highly questionable, because his wins were largely over weak opposition. Former World Boxing Organization welterweight champion Jeff Horn isn’t considered in the same class as the talented fighters at 147 like Errol Spence Jr., Danny Garcia, Keith Thurman and Shawn Porter. Crawford’s win over Horn wasn’t a big deal. For a lot of boxing fans, Lomachenko has the far better wins on his resume since 2017 compared to Crawford. Lomachenko’s win over Linares alone is enough for him to deserve the ESPY aware in my opinion. Those guys all had better wins than the victories that Crawford had in 2017 and 2018. GGG was held to a draw against Saul Canelo Alvarez last year, but he fought well enough to deserve the victory. That puts GGG above Crawford in my view. The lack of quality wins on Crawford’s resume over the last year makes him a suspect ESPY winner. Hopefully next year they do a better job of picking a fighter with some solid wins on their resume because this year’s choice was very disappointing. You’ve got to feel bad for Lomachenko, because he did more than enough to deserve the ESPY award this year.